Impression, from latin impressio – onis is a mark produced by pressure, that in a figurative meaning can also indicate a strong effect produced on the feelings; therefore Impressionism is a 19th-century movement which aimed to capture the momentary, sensory effect of a scene, the impressions objects made on the eye in a fleeting instant. Claude Monet is recognized to be one of the founders of Impressionism and he used to define his art as a result of the observation of nature; «For me, a landscape does not exist in its own right, since its appearence changes at every moment; but the surrounding atmosphere brings it to life – the light and the air which vary continually. For me, its only the surrounding atmosphere which gives subjects their true value». Masterful colorist and painter of light and atmospheres, he created a style considered as a beacon in figurative arts. 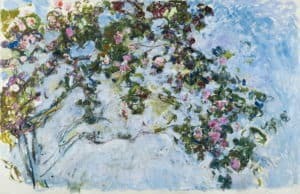 His incredible work will be temporarily avaliable for an exhibition in Rome (Ala Brasini, Complesso del Vittoriano) from the 19th of October, showing 60 paintings originally found in his home in Giverny and today part of the collection Musée Marmottant Monet in Paris. According to the curator Marianne Mathieu «these are not only Monet’s paintings. But those which belonged to him, those which he saw for the rest of his life hanging on the walls of his beloved house, in Giverny», from the rural landascapes, the weeping willows, the Primrose Lane and the most famous waterlilies. The father of Impressionism will write: «I perhaps owe having become a painter to flowers»; therefore if Monet hadn’t had his garden, he would have not given us an invaluable heritage and we may not look at a lily pond in the same way today, if we hadn’t «Waterlilies» (1916-1919 oil on canvas) “impressed”.